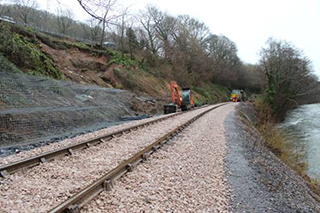 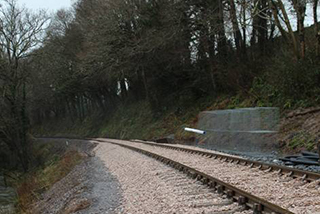 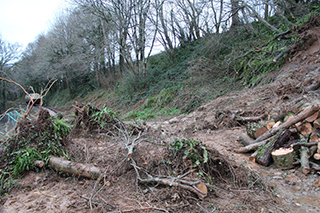 With Great Britain suffering storms over the Christmas period the South Devon Railway has unfortunately had to cancel its Mince Pie Trains due to a landslip between Buckfastleigh and Staverton; a distance of 4 miles 45 chains from Totnes. 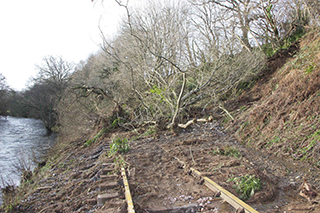 The area is now restricted to authorised personnel as its stability is assessed and a suitable scheme is developed for the repair. 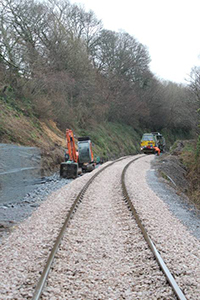 The Gift Aid Form for UK taxpayers will be of even greater advantage to the railway as we can recover the tax paid from such donations. 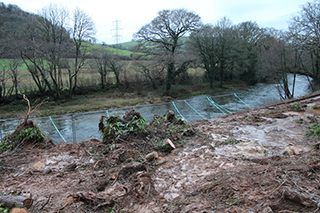 You can also make a donation and obtain further information by calling us on 01364 644370. 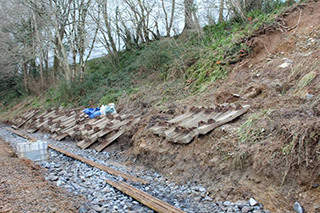 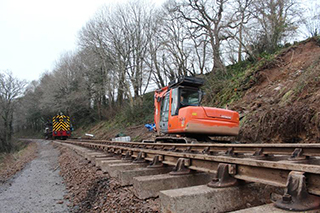 Other work will include lifting six lengths of rails and concrete sleepers in order to remove ballast which has been contaminated with soil and mud and assessing the damage caused to the track by the “sheer force” of the water. 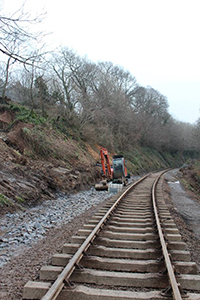 The majority of the repair costs will be covered by insurance, although the SDR will have to pay about £15,000 for the policy excess and other work not covered. 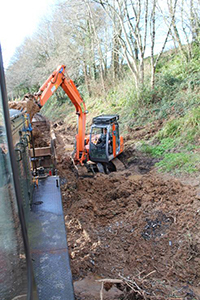 Now that the insurers have given us the go-ahead, a team from local contractor Kevin Thulborn have started work on site. 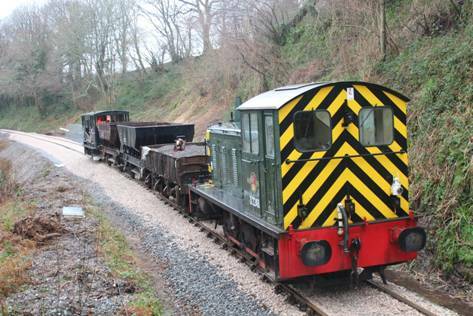 Kevin’s business is based in the former Staverton Joinery premises adjacent to our station so his plant was loaded onto the engineers train assembled in the yard at Staverton for transport to the site. 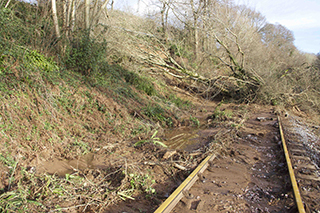 Three to four of his staff are clearing the fallen trees and also felling the others that are considered a future danger. 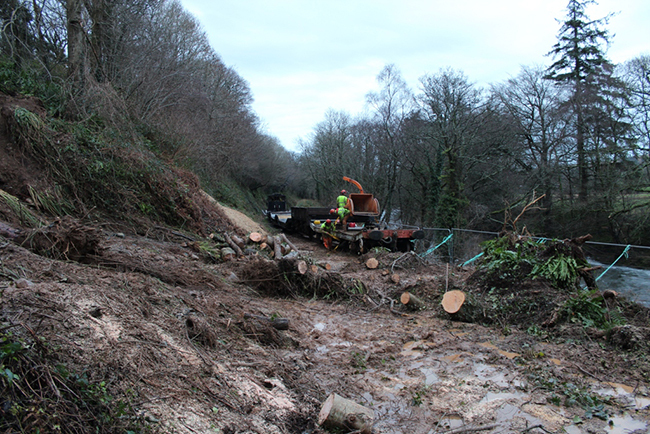 Larger branches are being cut into lengths and loaded onto the Lowmac and Rectank wagons by both his staff and our own team. 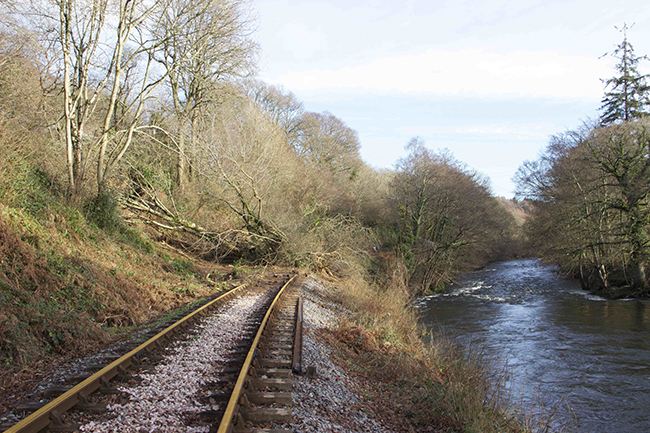 Smaller branches will be disposed of via a chipper that will be placed on the leading wagon. 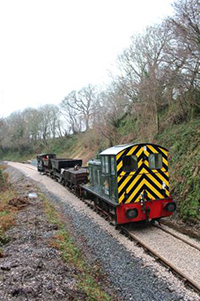 The wood chippings will be collected in the adjacent Grampus wagon and later sold or used as required in gardens on the SDR.